Looking for the perfect crisp recipe?? Look no further! 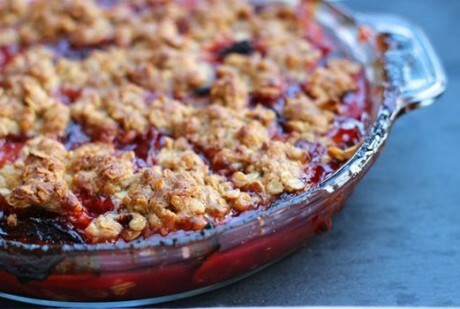 This is the easiest dessert you can make and the good news is you can change out the plums for any fruit you want. Plums are in season and they looked delicious at the store so that is what I used. You can use any kind of stone fruit, apple, berry, you name it. The first thing you want to do is preheat your oven at 350 degrees F and butter a 9" pie pan. In a bowl with the sliced plums add the sugar, corn starch, lemon zest, and lemon juice. Mix it until all the plums are coated. Add the plums to the pie dish. In another bowl mix together the oats, light brown sugar, flour, and cinnamon. To that add the cold butter and mix together with your fingers or a cutter until the butter is combined with everything. Add that to the top of the plum mixture and put in the oven. I like to put a baking sheet under the pie because sometimes it will bubble over and you don't want a mess in your oven! Let the crisp cook for 1 hour and then cool slightly before serving. I like to top it with vanilla ice cream to make it even more decadent. How easy is that? Enjoy!